The Trademark Cease and Desist letter is used to inform someone of a trademark violation. Many individuals still copy images and text without realizing it is a violation of someone elses rights. Many others do so with that knowledge, figuring they won't be caught or punished. If the individual will not cease, you can confront their ISP. Also consider copyrighting your code, text, and photos with the U.S. Copyright Office before publishing. This letter includes an impulse settlement and return receipt section. 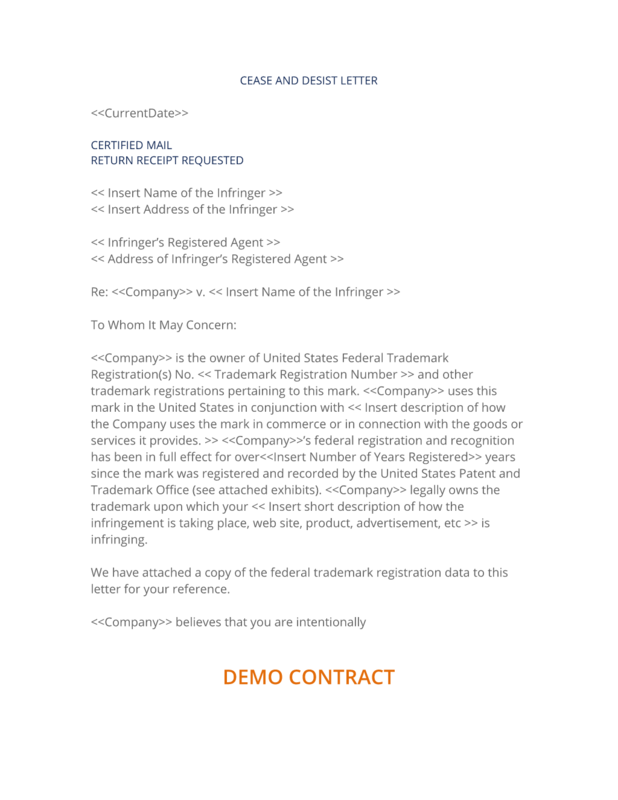 This Trademark Cease and Desist Notification Form is included in editable Word format that can be customized in Word or by using the included Wizard software. Name of the Infringer. Address of the Infringer. Infringer's Registered Agent. Address of Infringer's Registered Agent. Re: Company Name v. Name of the Infringer. Company Name is the owner of United States Federal Trademark Registration(s) No. Trademark Registration Number and other trademark registrations pertaining to this mark. Company Name uses this mark in the United States in conjunction with description of how the Company uses the mark in commerce or in connection with the goods or services it provides. Company Name's federal registration and recognition has been in full effect for over Number of Years Registered years since the mark was registered and recorded by the United States Patent and Trademark Office (see attached exhibits). Company Name legally owns the trademark upon which your short description of how the infringement is taking place, web site, product, advertisement, etc. is infringing. We have attached a copy of the federal trademark registration data to this letter for your reference. Company Name believes that you are intentionally trading on the goodwill of Company Name by using a trademark that is confusingly similar to Trademark Description and that your use of the Trademark does, or is intended to confuse or mislead customers seeking Company Name's products or services. This activity is actionable under federal law and causes you to be liable to Company Name in every state in which you have made sales or done business. Your activities are unlawful and constitute unfair competition, intentional trademark infringement and dilution, false designation of origin or cyber squatting if the Trademark involves a domain name. Federal Law provides numerous legal remedies for trademark infringement and dilution, including, but not limited to, preliminary and permanent injunctive relief, monetary damages, claim to a defendant's profits, destruction or confiscation of infringing products or items and in cases where infringement is shown to be willful and intentional, legal fees and up to treble (3x) monetary damages. Company Name prefers to resolve matters such as these without the need to take legal action, but it is prepared to take any action it deems necessary to protect its rights and property. You may avoid legal action by having an authorized representative sign this notice as indicated below and return the signed letter to us at the address listed below on or before Delivery Date. This letter is sent without prejudice to Company Name's rights and claims, all of which are expressly reserved. Immediately cease and desist from any and all use of the infringing mark(s), whether the marks are used in commerce or not, now or in the future. Insert whether a transfer of rights of the undersigned to any infringing domain names or other property must occur and the terms of such transfer. Immediately cease the use and distribution of all infringing works, works derived from the marks, whether obscured or not and all copies of such infringing materials. Deliver all unused, undistributed copies of any infringing works, or proof of the destruction of such copies. Job title of signator, authorized signature or signer. Date when the contact was signed. The complete Trademark Cease and Desist Notification Form - with the actual formatting and layout - is available in this Contract Pack.